The deal holds big promise for analytics, interoperability and pop health, while other organizations are already contemplating ways to make use of retail health data. While early reports about the planned $77 billion merger between CVS and Aetna focused on massive market share in the pharmacy and insurance realms, there is also the promise of a new era in analytics, interoperability and population health at the heart of the arrangement. CVS is the biggest pharmacy chain in the U.S. by a number of locations and prescription revenue, Aetna is the nation's third-largest insurance company. Epic Systems, which is not a party to the merger but has been a CVS partner since 2015, is the largest electronic health record vendor. The sheer size of these players means the deal stands to have a transformative impact on how healthcare is delivered in this country. For starters, data – and lots of it, given that CVS has 9,700 retail locations and more than 1,100 walk-in clinics nationwide – was clearly a huge driver for the deal. Alan Hutchison, Epic's vice president of population health, said that by using Epic’s Care Everywhere and Share Everywhere interoperability tools, CVS and Aetna could provide the rest of the community with information and insights to improve care. "What's really interesting about working directly with payers, providers, and patients is the ‘gray space’ – the opportunity that exists between traditional sites of care and all of the other organizations that are involved in the patient’s healthcare experience," Hutchison said. 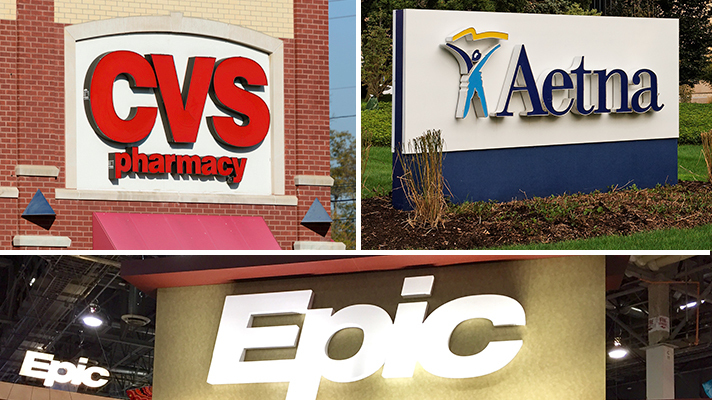 CVS signed on with the Verona, Wisconsin-based behemoth for its MinuteClinic locations back in 2015, and earlier this year expanded the partnership, choosing Epic to supply the electronic health record system for the care management programs of its CVS Specialty arm. Then in October, Epic and CVS announced another expansion of the partnership, with the pharmacy using Epic's Healthy Planet pop health analytics platform to learn more about drug dispensing patterns and medication adherence, with an eye toward more cost-effective prescriptions. "I can think of using the CVS retail data as a population health monitoring service, I can think of using the over the counter sales data tied to individuals to fuel predictive models for future opioid issues, or arthritis flares, or pulmonary hospital admissions or one hundred other things,” David Anderson, a research associate at Duke University Margolis Center, wrote in a recent blog post. “So from my former point of view as an insurance data geek, this merger offers an incredibly rich vein of data that can be mined and minted." Management of chronic disease – through patient engagement, telehealth and remote monitoring – is a fundamental aim of the CVS-Aetna acquisition. As Aetna CEO Mark Bertolini said when the deal was announced: "I think you have to think of it as keeping people away from the medical-industrial complex by offering better services in the home by meeting social determinants of health, which are big drivers of healthcare expenditures today, much bigger than people understand." CVS Health CEO Larry Merlo said the arrangement will enable the combined company to deliver services that many hospitals currently do not. “The traditional healthcare system lacks the key elements of convenience and coordination that help to engage consumers in their health,” Merlo said. “That’s what the combination of CVS Health and Aetna will deliver." Epic’s Hutchison added that bringing together such otherwise disparate pieces as the ones Bertolini and Merlo mentioned is in the best interest of patients because it can both improve outcomes and reduce costs. "Information is coordinated, friction is reduced, and data is used to predict what might happen to a patient so that steps can be taken through targeted programs to prevent negative outcomes or costly episodes of care," Hutchison said.